What are three of my favorite pastimes? Summertime, grilling time, pasta salad time. 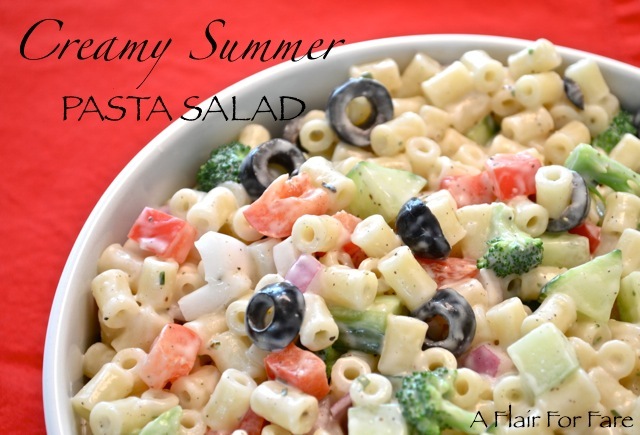 This creamy pasta salad is reminiscent of that old time classic macaroni salad, with the flavors kicked up. Great with ribs, chicken, burgers or fish. This recipe only yields 6 servings, so if you are feeding a big crowd you will want to double the recipe. Bring 2 quarts of water to a boil in a 3 quart saucepan. Add Tubetti with one tablespoon kosher salt and cook as directed on the package. Add broccoli to the pasta for the last 30 seconds of cooking. Remove from heat and drain in a colander. Rinse well with cold water to stop the broccoli from cooking. To a large mixing bowl, add your dressing ingredients and whisk vigorously. Pour the cooked pasta and vegetables over the prepared dressing and toss well to combine. Adjust seasonings as desired. Cover and refrigerate for at least an hour before serving.